Indian food and variety are synonymous. Nashta, as it is popularly called, is as varied as the diverse regions in India. From the simple steamed idlis, dosa varieties, pongal, and puttu in the South India to the paranthas, poori, and poha in the West and North, there are countless options to spice up your morning. Here are 15 such tasty recipes handpicked from various parts of India. Daily try one recipe from this list to give your family a healthy start. This is one of the healthiest south Indian vegetarian breakfast recipes, which is commonly served in all the 4 states of South India. Prepared from a fermented rice and urad dal batter, it is a steamed option served alongside chutneys and sambar. 1. Wash rice and dal separately until completely clean. 2. Soak both separately in clean water for about 4 hours. You can soak them overnight for better results. 3. Drain off the excess water from the rice and keep the water aside. 4. Grind the rice first in a wet grinder or food processor, adding water as and when required to make the batter smooth. 5. Transfer to a clean vessel. 6. Drain off excess water from the urad dal and keep the water aside. 7. Grind the dal first in a wet grinder or food processor, adding water as and when required, at regular intervals, to make the batter smooth. 8. Mix the ground rice with urad dal and grind for few more minutes, after adding salt. 9. The grinding process will take anywhere between 40 to 50 minutes. 10. Transform to a container and keep aside for 10 hours or more for better fermentation. 1. Mix the batter well using a ladle. Add more salt, if required. 2. Grease your idli plates lightly with sesame seed oil. 3. Meanwhile, add about 1.5 cups of water to your pressure cooker or idly pan and heat it. 4. 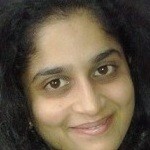 Add about ¾ ladle of the batter to each of the cup of the idli plate. 5. Place in the preheated idli pan and steam for about 10 minutes or till a toothpick inserted into the idlis comes out clean. 6. 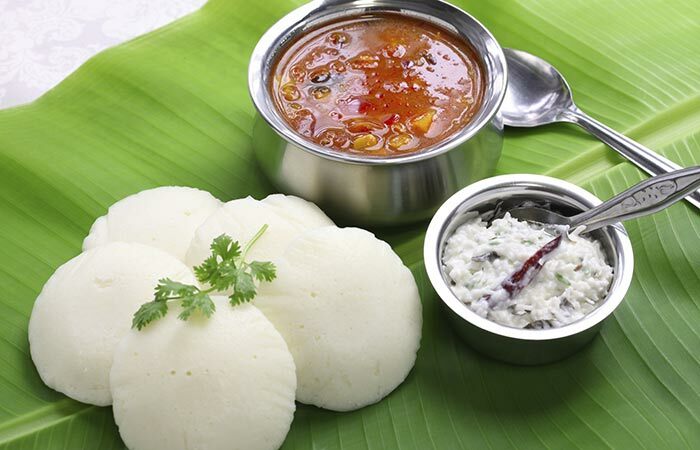 Serve fresh with chutneys of your choice, sambar, or idly chutney powder. 1. 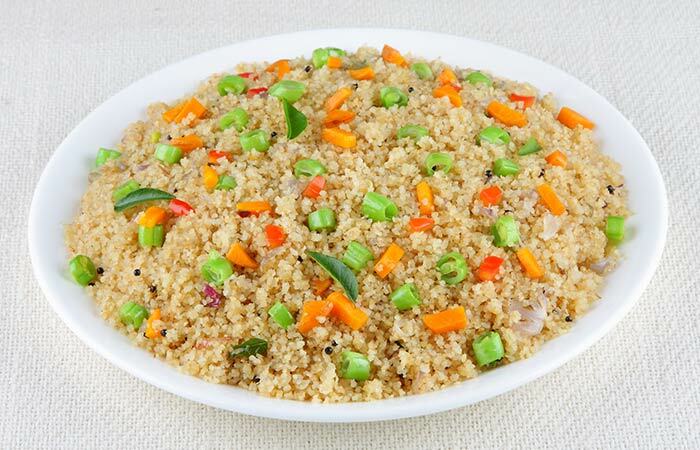 Instead of idli rice, you can use 2 cups each of raw rice and parboiled rice. 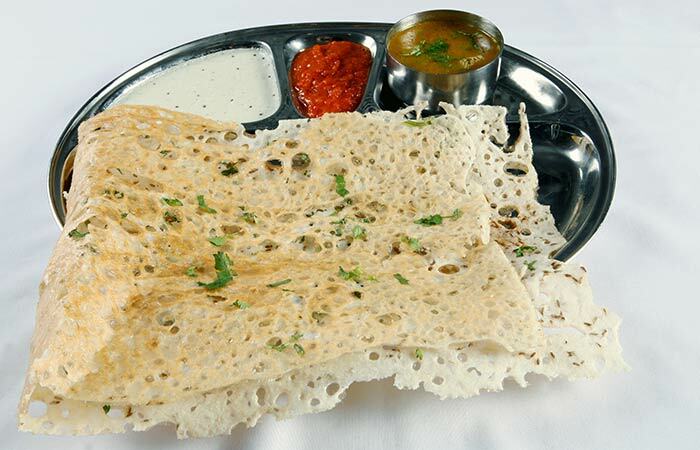 It is a popular and tasty breakfast choice in almost all South Indian households. There are various variants of this crunchy delight with certain ones using soaked dal. The one I am mentioning here is an instant one, which is easy to put together as it needs little planning. Add carrots, onions, green chilies, or any other spices of your choice for a twist. 1. Dry roast rava on a preheated kadai until just warm to touch. 2. Soak rava in buttermilk and keep aside for 20 minutes. 3. Grind the soaked rava with buttermilk and green chilies to a smooth batter. 4. Mix in whole wheat flour, rice flour and salt. Give a quick mix. 5. Heat the kadai with oil. 6. Add cumin seeds and allow to splutter. 7. Add curry leaves and give a quick stir. 8. Add onions and fry until golden brown. 9. Turn off the heat, add asafetida, and give a quick mix. Then add to the dosa batter. 10. Adjust salt to taste. 11. Preheat a mildly-greased non-stick tawa on medium heat. 12. Lower the heat to minimum and add a ladle full of batter to the tawa. 13. Slowly spread out into a thin large circle. [Be careful as it is not an easy task]. 14. Drizzle a few drops of oil and cook until the bottom turns golden brown. 15. Flip over and cook for 2 more minutes. 16. Serve hot with spicy tomato chutney. 1. Add a ladle full of batter on the outermost corner of the tawa. 2. Fill in slowly making a thin dosa. 3. Fill the gaps, if any at the end to get a lacy dosa. 4. Sprinkle onion on top of the batter. 5. Cook with about 1 tsp oil on each side to make the dosa crispy. Prepared using broken wheat, this is a filling and tasty breakfast option. You can use the veggies of your choice. Just make sure that all the veggies, except onions, are chopped the previous night. Add about ½ cup of roasted moong dal to add protein to the breakfast. 1. Clean broken wheat under running water thrice and roast in 1 tsp oil on medium flame until slightly warm. 2. In a small pressure cooker, add 3 tsp oil. 3. Add mustard seeds and allow to splutter. 4. Add urad dal, curry leaves, and sauté until the dal gets a golden hue. 5. Add onions, ginger pieces, and green chillies. 6. Sauté till the onions turn deep brown. 7. Add the veggies and peas and give a quick mix. 8. Mix in broken wheat and mix thoroughly. 9. Add water, salt, and bring the mixture to a boil. 10. Cover with lid and pressure cook for 1 whistle. 11. Lower the heat and cook on low heat for another 5 minutes. 12. Switch off and wait for the pressure to subside. 13. Remove the lid and add a teaspoon of clarified butter. 14. Sprinkle coriander leaves and serve hot with chutney of your choice. This paratha is filling and tasty. Serve it with a spicy garlic-mint chutney, pickle, and curd for a mind boggling treat. 1. Add oil to the flour and salt mixture. Mix well. 2. Add enough water to the flour mixture and knead to make a soft dough. 3. Cover with a clean muslin cloth and keep aside. 4. Heat 3 tsp oil in a preheated pan and add cumin seeds. 5. After cumin seeds splutter, add ginger garlic paste and sauté for 2 minutes. 6. Add onions and sauté until golden brown. 7. Add red chili powder and salt. Mix well. 8. Add mashed potatoes and mix well. 9. Mix in coriander leaves and adjust the seasoning. 10. Transfer to a plate and allow it to cool. 1. Knead the dough again and divide into 10 equal portions. 2. Roll each portion into a thick circle. 3. Divide the stuffing into 10 equal portions. 4. Place one portion of the stuffing inside the circle and close the edges of the circle to resemble a ball. 5. Slowly roll out into a thick circle again. 6. Preheat a greased tawa on medium to high heat. 7. Place the rolled out parantha on the heated tawa and cook until the bottom portion gets dark brown spots. 8. Sprinkle a little clarified butter and flip over. 9. Cook until the flipped over portion gets dark brown spots. 10. Serve hot with pickle and curd. 11. Make 9 more paranthas with the rest of the dough and filling. The golden, deep fried Indian bread is a popular choice for breakfast across the Indian states, especially on cold Sunday mornings. Made with whole wheat flour, these puris are quite often served with potato curry. 1. Heat oil in a deep pan placed on medium heat. 3. Add onions, green chilies, and curry leaves and sauté until onions turns golden. 4. Add tomatoes and cook until they turn pulpy and soft. 5. Meanwhile, mash potatoes partially. 6. Add mashed potatoes, salt, and water, if required, and allow the mixture to come to a boil. 7. Simmer for 2 to 3 minutes. 8. Add grated ginger, coriander leaves, and asafetida. Bring to a boil and turn off. 9. In a small pan, heat ½ a tsp oil. 10. Add carom seeds and allow to splutter. 11. Pour this into the potato curry and mix. 12. Transfer to a serving dish till served. 1. Sieve the flour with salt. 2. Add water, as required, and knead to a stiff, yet smooth dough. 3. Shape the dough into small balls. 4. Roll out into thin, small circles. 5. In a deep frying pan, heat oil on medium to high heat. 6. Add the rolled puris into hot oil and deep fry until both the sides turn golden brown. 7. Serve hot with aloo subzi. Yes, it looks simple, but the flavors just burst in your mouth. 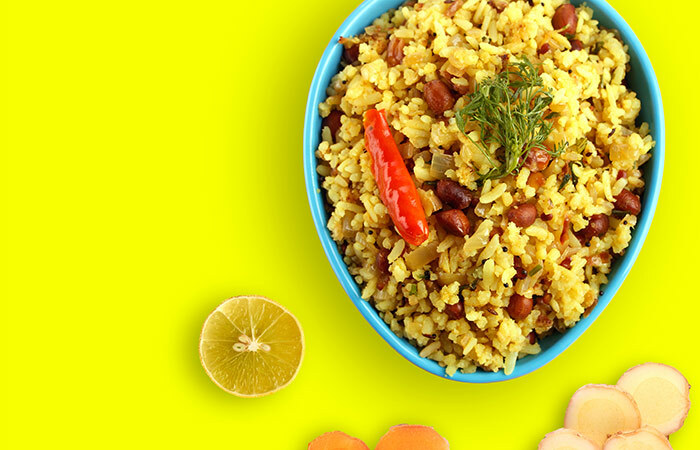 A humble blend of potatoes, onions, peanuts, and beaten rice with a tangy twist rendered by freshly squeezed lemon juice – words are sure to fail you! Serve it with a glass of milk and a handful of almonds for a complete meal option! 1. Wash poha under running water and transfer to a colander to drain completely. Keep aside. 2. In a deep frying pan, heat oil on medium to high flame. 4. Add green chilies, onions, and curry leaves and sauté until onions turn pale golden. 5. Add potatoes and stir-fry until potatoes turn soft and brownish. 6. Add turmeric powder and sugar and give a quick mix. 7. Mix in crushed peanuts and salt. Stir quickly. 8. Add poha and give a quick mix. 10. Turn off the heat, mix in lemon juice and coriander leaves. 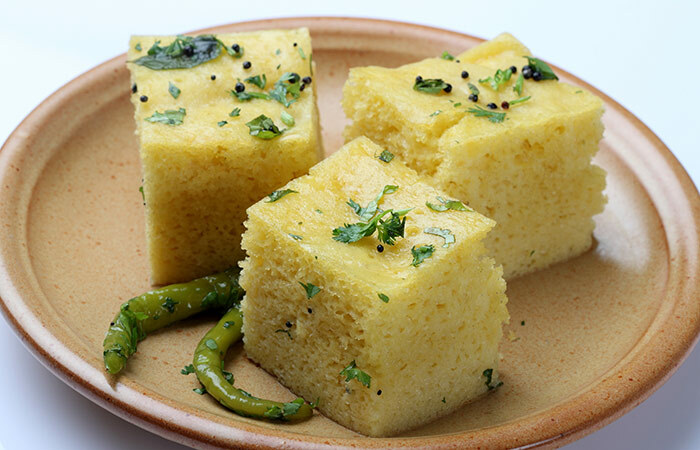 While this Gujarati delicacy is often served as a snack, it makes a wonderful breakfast option too. The traditional recipe calls for the use of gram flour. However, I have used moong flour in my recipe. And, to enrich its nutritional value, I have added grated carrots too. These are rich in iron and protein, plus offer a good dose of folic acid. 1. Wash moong dal thoroughly with water and soak in clean water for about 2 hours. 2. Transfer to a colander and allow to drain. 3. Add drained dal and 3 green chilies to a blender and blend to a smooth paste with very little water. 4. Transfer dal paste to a mixing bowl. 5. Add gram flour, carrot, curd, salt, and asafetida and mix thoroughly. 7. Dissolve 1 tsp fruit in 2 tsp water and mix to one half of the mixture. 8. As the mixture bubbles, grease a 7 inch thali and transfer the mixture into it. 9. Swirl the thali to ensure even spreading of the mixture. 10. Place in the steamer for about 10 minutes or until a teaser inserted comes out clean. 11. Transfer to a plate, cool, and slice into squares. 12. Repeat the same with rest of the mixture also. 13. In a preheated pan, heat oil. 14. Add mustard seeds and cumin seeds and allow to splutter. 15. Add the leftover green chilies and curry leaves to this mixture and sauté for a second. 16. Arrange the sliced dhoklas in a large plate and garnish with coconut shavings. 17. Pour the seasoned mixture over the garnished dhoklas and serve alongside dates chutney and mint chutney. This is yet another steamed breakfast option that comes from God’s Own Country, Kerala. 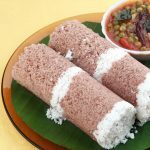 Traditionally, puttu is prepared by mixing red rice with salt, coconut water, and coconut shavings and then steamed in a tube like vessel called Puttu Kudam. 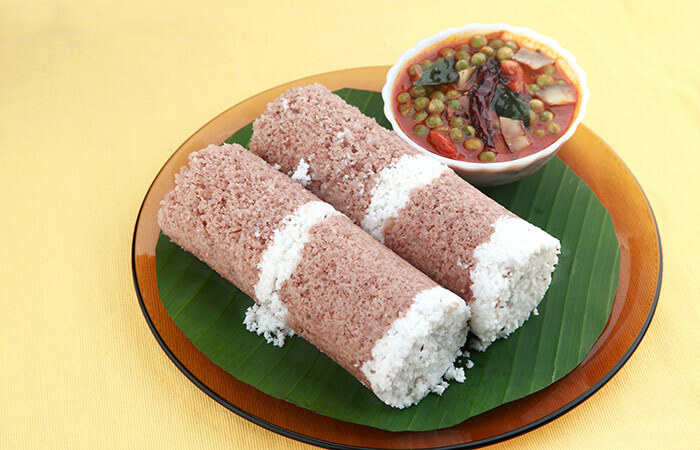 Things have changed and today there are many variants of puttu, including finger millet and whole wheat. This recipe calls for the use of whole wheat flour. Serve it along with bananas or a spicy black chickpea simmered in coconut gravy for an authentic Kerala touch. 1. Add the whole wheat flour to a preheat deep pan placed on medium heat. 2. Roast for 5 minutes, stirring, on medium heat. 3. Transfer to a mixing bowl and allow cooling down slightly. 4. Add salt and give a quick mix. 5. Add little water at a time, and using hands mix the batter to look akin to bread crumbs. 6. Close and keep aside for about 8 to 10 minutes. 7. Add 2 tbsp of the grated coconut to this mixture and give a quick mix. 8. If you have a puttu patram, then follow steps 9 to 11 or else go to step 13. 9. Fill 2/3 rd of the puttu kudam with water. Place on medium heat and allow the water to start boiling. 10. 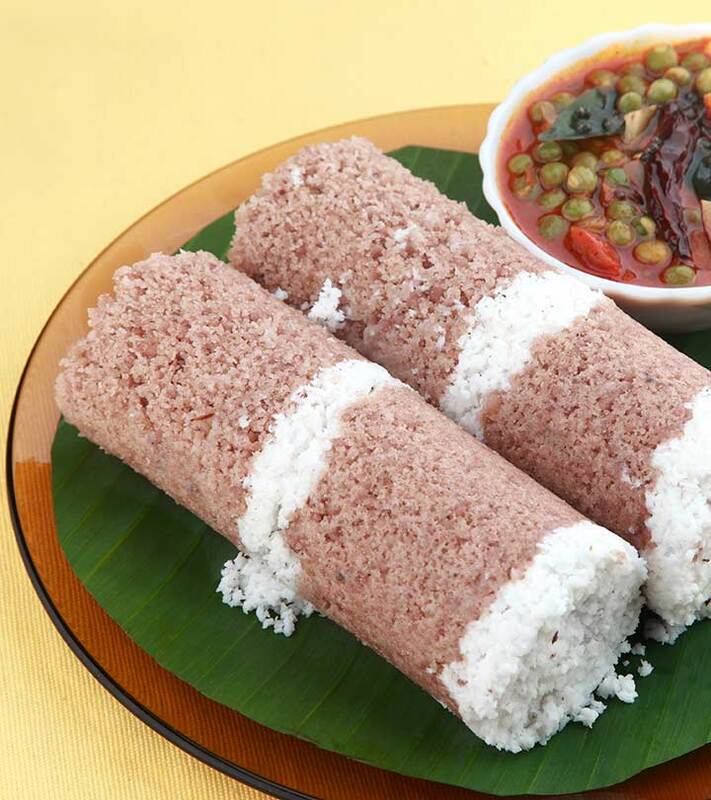 Take the cylindrical portion of the puttu patram and start filling it with coconut and wheat flour alternatively, starting and ending with coconut. Close with the lid. 11. Place the cylinder atop the boiling water and steam for about 10 minutes or until the steam starts coming out of the small holes. 12. Take the cylindrical part off the base and using the handle of a long spoon, push the puttu onto a plate. Serve hot with bananas or black chickpeas curry. 13. If you do not have a puttum kudam, you can use an idly plate or even a circular vessel akin to cake pan. [7 inch round cake pan]. 14. Grease the pan slightly with oil [the oil should be negligible]. 15. Add the coconut and wheat flour alternatively, starting and ending with coconut. 16. Meanwhile, add 1 cup of water to your pressure cooker. Place a small bowl [3 inch diameter round] inside the pressure cooker filled with water and allow the water to start boiling. 17. Place the filled pan atop this small bowl. 18. Close the pressure cooker and steam for 10 minutes. 19. Remove from the cooker and serve hot along with bananas or green gram simmered in coconut gravy. Also known as kallappam, it is yet another authentic Kerala breakfast recipe. The actual version uses toddy and hence the name Kallappam. However, these days yeast in used for the fermentation process in the place of toddy. It is easy to make and can be served with a spicy dish of your choice. 1. Dissolve sugar in warm water, add yeast, and keep aside until the mixture turns frothy. 2. Wash raw rice thoroughly and soak for about 8 hours or overnight. 3. Drain the rice well. 4. Blend the drained rice and cooked rice with coconut to make a smooth batter. 5. Add the yeast solution along with salt to this rice and coconut mixture. Keep aside for 8 hours or overnight for fermentation. 6. Heat a slightly-greased non-stick appam pan on medium heat. 7. Pour a ladle full of appam batter into the pan and swirl clockwise to ensure even spreading. 8. Close the pan and cook until edges turn golden brown. 9. Flip over and cook for 20 seconds. 10. 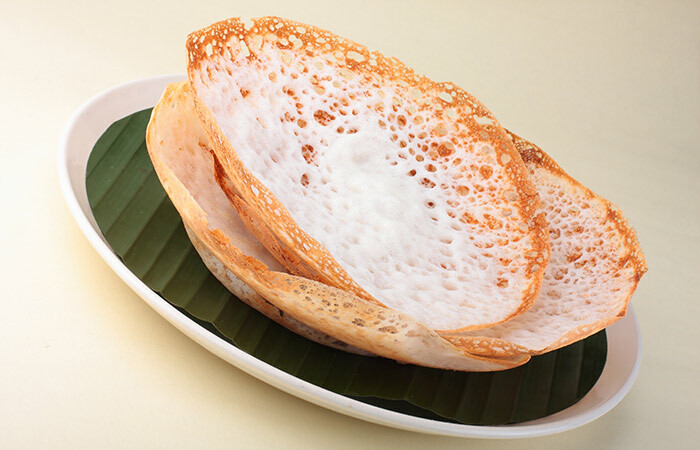 Appam is ready when edges are crispy and centre is soft and fluffy. 11. Serve hot with a spicy egg curry or potatoes simmered in spicy coconut gravy. This is a breakfast delicacy from Andhra Pradesh and is a great source of protein. It is also known as Moong dal chila in the northern regions of India. A very simple delicacy, it is versatile enough to be modified to meet your palate requirements. Make it thick or thin as per your needs and serve with ginger peanut chutney or mix vegetable simmered in coconut gravy. 1. Wash the moong dal and rice thrice under running water and soak overnight. 2. Drain and keep the water aside. 3. Add moong with rice, green chilies, ginger, cumin seeds, and salt to a blender and grind with very little water to a smooth batter. 4. Add enough water to make the batter attain pouring consistency. 5. Adjust the salt level. 6. Transfer to a mixing bowl and keep aside. 7. Mix chopped onions and green chilies and keep aside. 8. Place a slightly- greased non-stick griddle on medium to high heat. 9. As the tawa gets heated up, pour a ladle full of the dosa batter onto the griddle. 10. Spread into concentric circles akin to dosa. 11. Sprinkle about ½ tsp oil and about 1 tsp green chili-onion mixture. 12. Cover with a lid and cook on medium flame under bottom portion turns brown and corners of the dosa starts rising up. 13. Fold into halve and serve hot with the chutney of your choice. You can add grated carrots and sliced and roasted garlic for added flavor. I simply love adai. Packed with protein, this Tamil Nadu special delight often comes along with Avial [mix vegetables simmered in coconut-green chili gravy]. Add lentils of your choice. While the traditional recipe calls for the use of raw rice and parboiled rice in equal proportion for the carbohydrate part, I generally use oats or finger millet for that part. Here is the authentic version of adai. 1. Wash both the rice well under running water and soak them together for at least 4 to 6 hours. 2. Wash all the dals together and soak with rice. 3. Transfer the rice and dal mixture to a straine and allow draining. 4. In a blender, crush chilies with salt and asafetida. 5. Add rice and dal and blend to a coarse mixture with little water. 6. 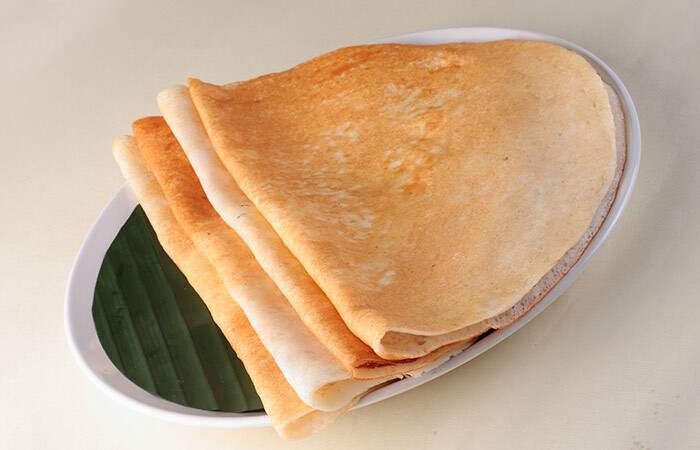 The batter should be of pouring consistency, but thicker than that of normal dosa batter. 7. Add chopped curry leaves and adjust the seasoning. 8. Heat a slightly greased non-stick tawa on medium heat. 9. Pour a large ladle full of adai batter on the center of the tawa and spread into a thick circle. 10. Drizzle a teaspoon full of oil around the dosa. 11. Cook on medium heat for about 4 to minutes or until the bottom portion turns golden brown. 12. Flip over, add a little more oil, and cook for 3 minutes more or until brown spots start appearing on the flipped over side. 13. Serve hot with idly milaga podi or avail or even fresh curd. 1. You can add finely chopped onions to adai batter. 2. Grated carrots also make an excellent addition. 3. Omit chilies and add black peppercorns for added flavor. Finger millet makes an excellent carbohydrate substitute for rice. A versatile carbohydrate packed with calcium and iron, it is an ideal breakfast choice if you are on a weight loss routine. Add a handful of moong dal powder while preparing the batter or serve with 6 almonds for a complete meal option. 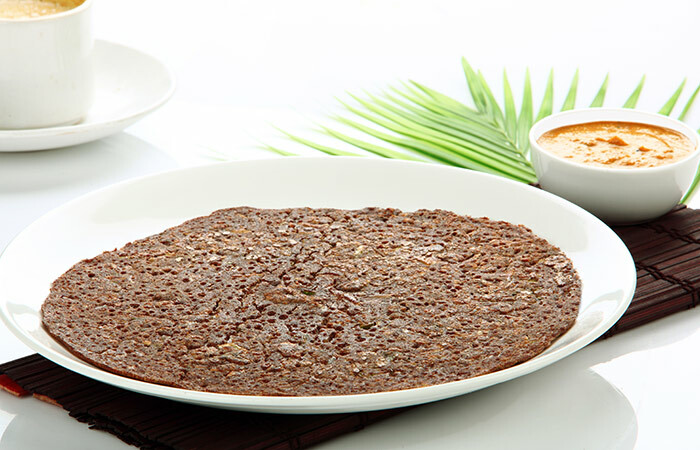 You can even soak urad dal and grind it to make a fermented ragi dosa. 1. Mix ragi, wheat flour, and salt with buttermilk and water to make a thin batter. 2. Fold in onions, curry leaves, green chilies, and cumin seeds. 3. Grease a non-stick griddle slightly and preheat it on medium to high flame. 4. 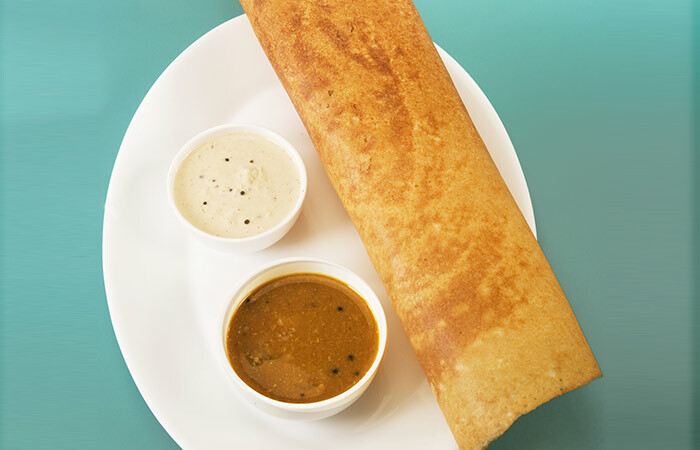 Pour a ladle full of dosa batter and slowly spread it out as thin as possible. 5. Drizzle oil and cook until the corners start lifting alone and bottom portion turns brown. 6. Flip over and cook for 2 more minutes. 7. Serve hot with coconut chutney or onion tomato chutney. Quite famous as Vrat ka khana, this one is a filling delight. Despite being packed with calories and starchy carbohydrate, it tastes good. Make sure you squeeze in lemon juice only after turning off the flame to avoid the breakfast from turning bitter. 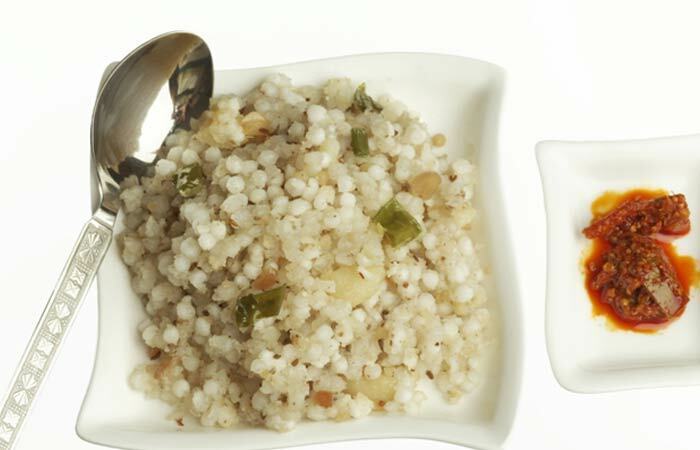 Opt for the smaller, pearl white sago for preparing this. 1. Wash sago thoroughly under running water thrice. 2. Soak washed sago in 1 cup of water for about 4 hours or till sago pearls swell up and separate. 3. Heat a deep frying pan on medium heat. 4. Dry roast peanuts, peel the skin, and crush them coarsely. 5. In the same pan, add clarified butter and allow heating up. 6. Add cumin seeds and allow spluttering. 7. Add curry leaves and green chilies and sauté for a minute more. 8. Add potato cubes and sauté until potatoes turn soft and done. 9. Mix in sago and coarsely crushed peanuts and sauté for 5 more minutes. 10. Sprinkle 2 tsp water and mix in salt. 11. Give a quick stir. Adjust the seasoning. 12. Turn off the heat and mix in lemon juice. 13. Garnish with coriander leaves and serve hot. 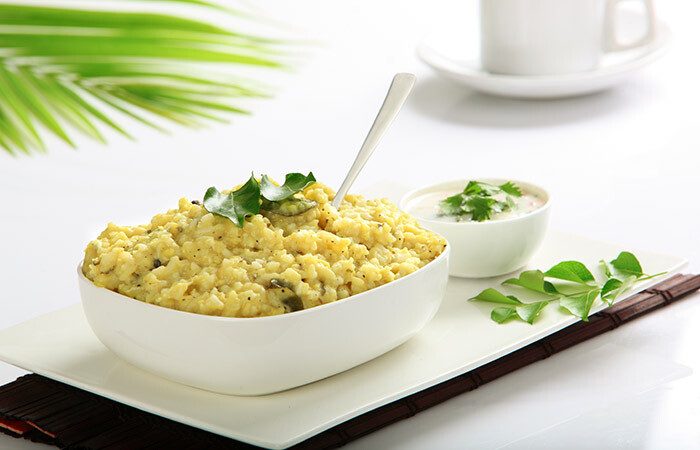 A delicious blend of rice and moong dal, this one is quite popular for breakfast in Tamil Nadu and Karnataka. Seasoned with partially crushed black peppercorns and cumin seeds, this is served along with onion sambar and roasted gram chutney. You can use brown rice instead of normal rice for added health benefits. 1. Wash moong dal finely and drain well. 2. Dry roast on medium flame until a nice aroma comes. 3. Wash rice well under running water and mix it with roasted moong dal. 4. Add rice and dal to a vessel and add water to it. 5. Mix in salt, as desired. 6. Pressure cook up to 3 whistles on high flame. 7. Lower the flame and cook for 5 more minutes. 8. Turn off and wait until the pressure completely subsides. 9. Meanwhile, heat the clarified butter in a pan. 10. Add cumin seeds and allow spluttering. 11. Add curry leaves, almond slices, and black peppercorns and sauté until the almonds turn deep brown and peppercorns start spluttering. 12. Take the dal and rice mixture out from the cooker. 13. Mix in the seasoning and serve hot alongside chutney and/or sambar. 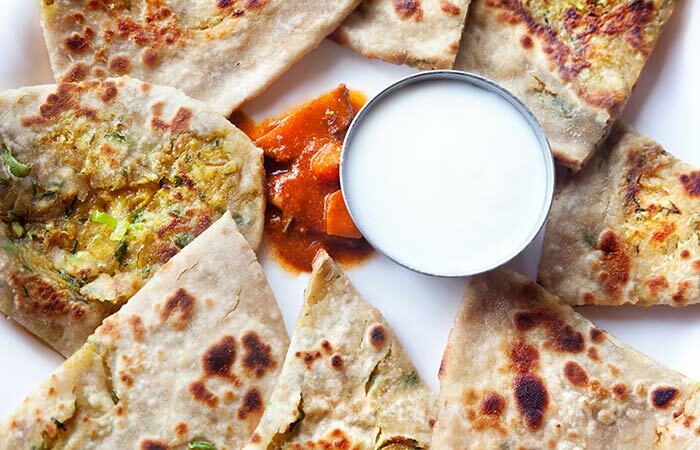 Here comes a healthy Indian vegetarian breakfast recipe made with whole wheat flour, this Indian flatbread version is quite simple. 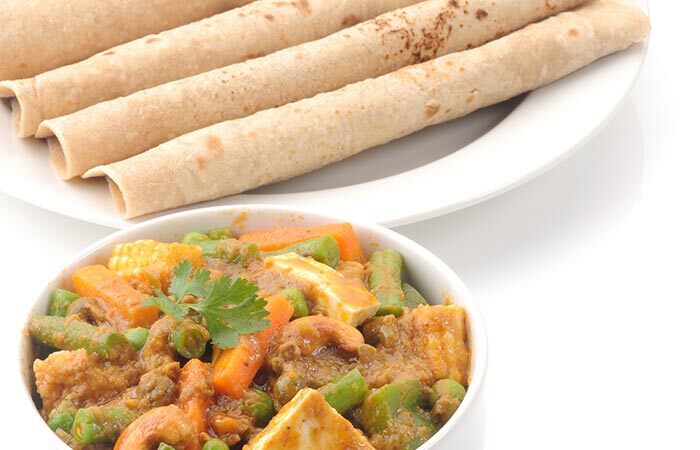 You can enjoy it with a dal or veggie of your choice. Even a cup of milk or a pickle will do the job. Or just spread some veggies atop the phulkas and roll into an on-the-go breakfast choice! 1. Sieve flour with salt. 2. Add water, little at a time, and knead the mixture into a soft dough. 3. Cover with a cotton or muslin cloth and keep aside for about 30 minutes. 4. Knead the dough again and divide it into equal sized balls. 5. Dip each ball in whole wheat flour and roll out into a circle of medium thickness. 6. Heat a non-stick griddle on medium heat. 7. Place the rolled out phulka on the heated griddle and cook until small bubbles appear. 8. Flip over and cook for a minute more. 9. Using tongs, transfer the phulka onto high flame directly. 10. It will puff up like a balloon. 11. Flip over and cook for a second or two more. 12. Serve hot with a little clarified butter, vegetable of your choice, or with anything you wish to. These south Indian vegetarian recipes for breakfast offer tasty and healthy options to kick off an energy packed day. A simple, balanced breakfast will provide you with all that you need to stay healthy and energetic. Try these quick and easy Indian vegetarian breakfast recipes and you are sure to enjoy each one of them. 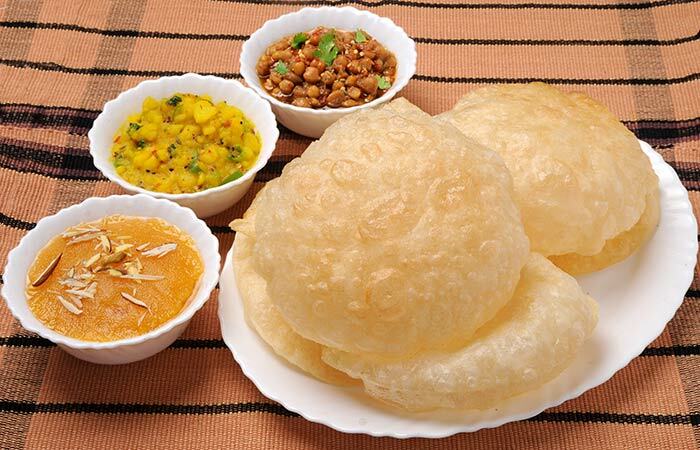 What is your choice of Indian breakfast? Idli, dosa, masala dosa or anything else? Share with us in the comments section below.